WE southerners took a lot of ribbing while serving on the DALY, but one of my most embarrassing moments occurred when I caught up with the ship in Cuba in the fall of 1952. As a Reservist called on active duty in March, I was assigned to the ship in Charleston where it had just gone into dry dock for minor repairs. During this time, the ship's office was temporarily located in a building in the shipyards. I spent most of that summer in yeoman's school at Bainbridge, Md. Meanwhile, the ship sailed to Guantanamo on a shake-down cruise. Eventually, I joined the crew and learned that the days were spent in long, tiresome training. On that first morning, I made my first visit to the ship's office and chatted with Jack Minon from upstate New York, who told me I should stay in the office until further notice since I hadn't been assigned a duty station.. As we talked, the ship's phone rang, but Jack ignored it. When I offered to answer it, he said, "Oh, we don't answer that." Okay. We had telephones in Alabama – at least we did after I was nearly grown and we'd moved to the small town of Fairfield. We answered ours, but I figured Jack knew what he was talking about. Soon, everyone else disappeared. 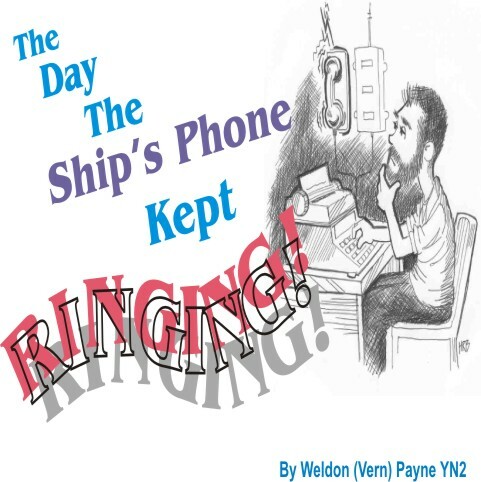 In a very few minutes, the ship's phone rang. And rang. I had no idea why I shouldn't answer it, but I didn't worry. I ignored it. It rang quite a lot. Soon a sailor came bounding down the ladder and informed me that Commander William Klein, our Exec, wished to see me on the bridge. He had seemed like a nice enough guy. So, dressed in my denims, I was making my way to the bridge. It seemed like half the crew was watching. Before I made it up the ladder, the Exec looked down at me and asked: "Didn't you hear the phone ringing, Payne?" It was very quiet. Not a wave was stirring. Not a single sailor coughed. "Then why didn't you answer it?" he asked in cool, crisp tones. A multitude of eyeballs focused on me from the bridge. Everyone was listening. I had no doubt that even the bo's'n on the fan tail was waiting for my reply. "I didn't know I was supposed to answer it," I said, knowing with absolute certainty even as I spoke that I was confirming all the suspicions that shipmates from New York, Detroit, Chicago, Pennsylvania and everywhere else north of the Mason-Dixon already had about the Alabama bumpkin. I waited, helpless, for Commander Klein's response. It was brief. As crisp as his neatly pressed khaki shirt and pants. Incredulous. "You didn't know you were supposed to answer the phone?!!" "No sir," I answered in a very weak voice. Palms upward, his arms arose, like wings. He shook his head, shrugged, and walked away. I could almost hear the smirks cracking Yankee faces all over the starboard side of the ship. Somebody whispered that I was to take the starboard lookout. I tried to fade away, desperately searching for a pair of binoculars. The Exec never said why he had called. I wasn't about to ask. And I swore I'd never speak to Jack Minon again.